Despite being only a 10 minutes walking distance from the hustle and bustle of Saint Peter’s square, Il Sorpasso is a refreshingly non-touristy restaurant that caters to the chic clientele that works in this business-dominated neighborhood, Prati. It is a trendy but friendly restaurant without the pretenses that would usually come along with its well-dressed crowd and offers a wide-array of menu items to choose from, including many options for vegetarians. Il Sorpasso is somewhat rustic, with light brick accents and omnipresent dry meats hanging by the entrance, and yet elegant as well, with vaulted ceilings and an impressive list of cocktails. It can be hard to find a restaurant that serves creative spins on traditional dishes (from pastas to meats to salads) but this is one of them. From fettuccine made of farro with pumpkin, rosemary and pecorino to ravioli stuffed with cheese and pepper in a saffron sauce, everything is delicious, comforting and made with high-quality ingredients. There is a nice list of Italian wines in addition to various mixed drinks and fresh-squeezed juices. 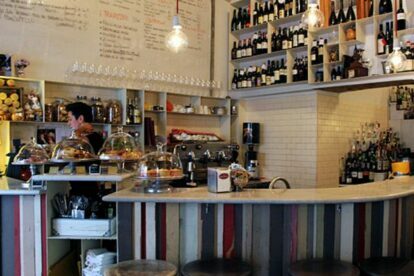 Open from morning through the night, you can stop by for breakfast, lunch, aperitivo or dinner. They provide some nibbles at aperitivo hour or you can order some cheeses and cold cuts if you have a bigger appetite. I like this place for its atmosphere – fresh, cool and relaxed – and excellent value. It’s one of the best hidden gems in Rome!